Welcome to the smallest page on the web. You've downloaded some tiny drops of pond water. These pages will guide you through the hidden world of freshwater microorganisms. Pond life is one of the most fascinating subjects to examine with a microscope. Almost all major groups of lifeforms can be studied in close detail. 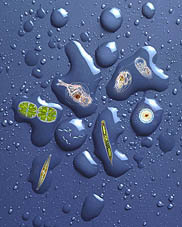 These pages portray some of the most common microscopic organisms that live in fresh water. The list is not a complete account of all inhabitants of such waters. Some examples of creatures that were not mentioned in these pages can be found in the Pond life identification kit. It is relatively easy to find all these creatures yourself. The easiest way is to grab a bit of the green scum that grows in a pond and squeeze the water from it in a jar. Many single-celled organisms and other microscopic life forms can be found this way. You can examine them with a hand lens but for the smaller microorganisms a microscope is needed. to learn more. Thank you.